Today we enjoyed a visit from Bamboozle Theatre Company who presented another of their beautiful shows to students from Classes BK, HN and Green Island and some from FS, LB, Explorers and JW. The talented cast were Ben, Rosie, Gren and Amy. 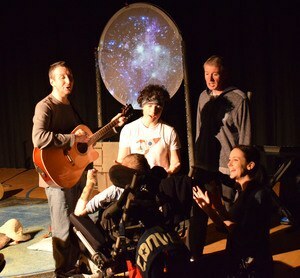 The show ‘Moonsong’ is a space-themed production, in which the audience are welcomed with relaxing music into the performance space. The production tells the story of Megan, who falls asleep and dreams of travelling to the moon where she sees comets, shooting stars and silvery tube creatures. It was amazing to see the students drawn into the story and how engaged they were with it. We loved our visit to the moon and thank Perenco and FoVEC for funding this visit.